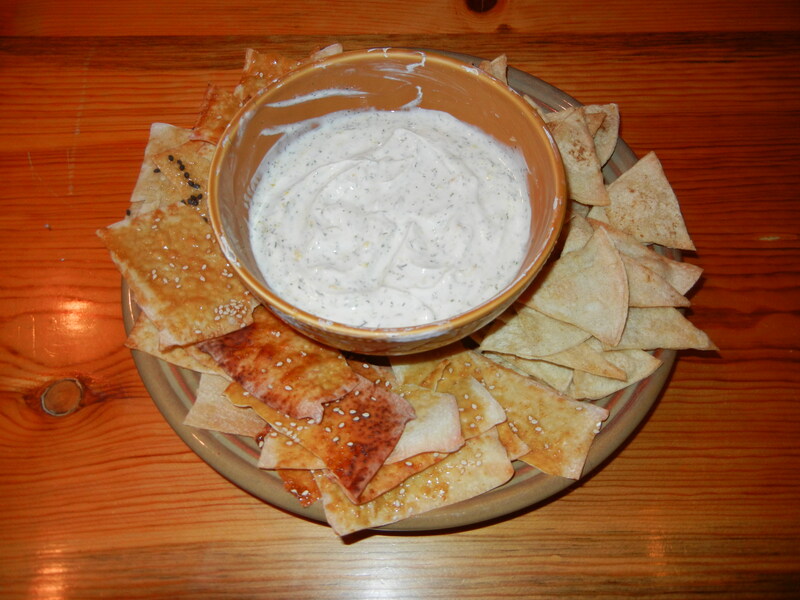 It is officially chip and dip time. I actually am very found of the crunch of chips, particularly good corn chips, but most of them have too much fat for me to eat them often – and I haven’t yet found really low fat corn chips that taste good. Most of them are also too salty for my taste. But there are good corn tortillas that don’t have much fat. And it occurred to me that a tortilla is a corn chip waiting to happen. Preheat oven to 400. Spray 1 side of each tortilla with cooking spray; cut each tortilla into 8 wedges. 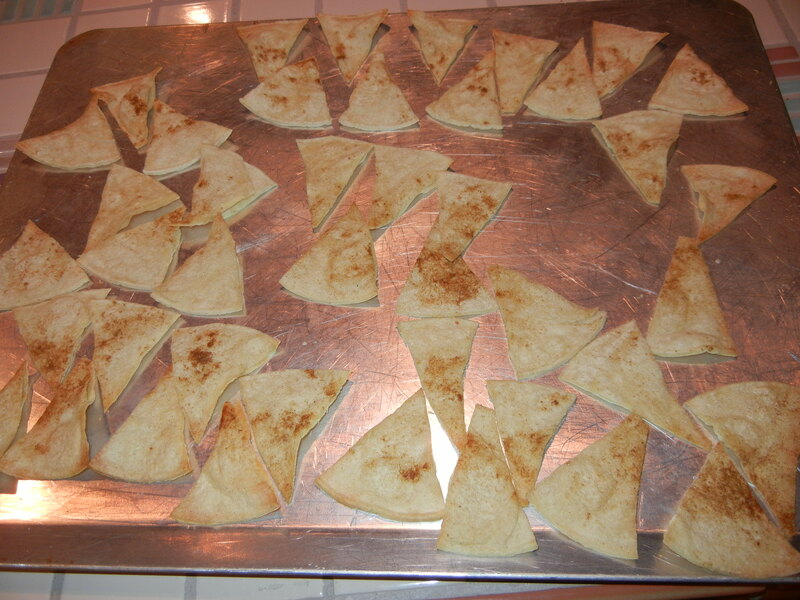 Place the wedges on a large baking sheet; sprinkle with salt and cumin. Bake for 10 minutes or until lightly browned. Check frequently to make sure they don’t burn. Cool. Makes 3 servings, at 3 grams of fat for 32 chips. NOTE: you could really spice these up with cayenne pepper or other spices. OK, these were kind of experimental, and I have mixed feelings about them. The recipe came from Relish, one of those little magazines that comes stuffed in your newspaper (for those of you who still get a paper newspaper.) I think I would like them better if I had a fruity dip or salsa, rather than the creamy dip I made. I also think that the wontons need to be cut in half, either into rectangles or triangles. The big square wonton wrappers are kind of ungainly once they are crisp. Preheat oven to 400. Spray a baking sheet with cooking spray. Whisk together honey, soy sauce, and garlic powder. Lay wonton wrappers out on prepared baking sheets. 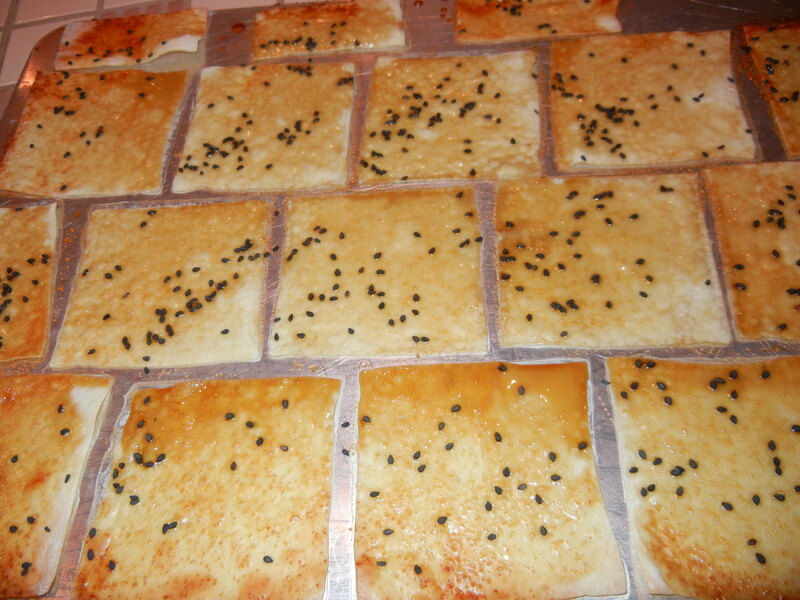 Brush with soy sauce mixture and sprinkle lightly with sesame seeds. Bake for 7 minutes or until lightly browned and crisp. Makes 6 servings at about .5 grams of fat/serving. I sprinkled some of them with black sesame seeds for contrast. Makes about 1 cup of dip, with 0 grams of fat/serving.